Wanderers Secure Premiership With 3-0 Win Over Newcastle! The Western Sydney Wanders have secured the A-league Premiership in their inaugural season following a dominant 3-0 win over the Newcastle Jets in Newcastle. A Mark Bridge brace and a Rocky Visconte thunderbolt securing 1st place at the end of the A-League Regular season. 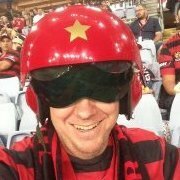 The Wanderers have finished their first season in the A-League in 1st place, with 18 wins, 3 draws and 6 losses after 27 games, a goal difference of +20 and a total point tally of 57. 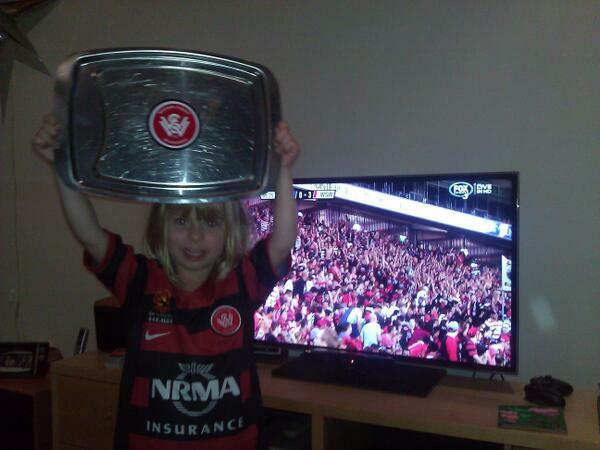 Needing just a draw to secure the title the Wanderers took all three points & the Premiership in assertive fashion. Manager Tony Popovic sprung a surprise with his selection, 19 year old Yianni Perkatis making his A-League & Western Sydney Wanderers debut in place of Jason Trifiro who was fatigued after playing a full 90 minutes in the previous weeks fixture. In front of the 10,000 travelling supporters who invaded Newcastle, the Wanderers title triumph was on track from the 5th minute. Tarek Elrich's diagonal cross found Labinot Haliti, who stretched well to knock the ball across the face of goal. Dino Kresinger craftily dummied to confuse Newcastle keeper Mark Birighitti, Mark Bridge benefiting to tap into an open net from point blank range to score his 10th goal of the season. With Newcastle having very little of note in attack, Western Sydney double their advantage with half an hour played. Nikolai Topor-Stanley as he's always been this season was in perfect position to clear, an acrobatic over the shoulder effort that flew over half-way. The ball fell fortuitously toward Kresinger who towered over his marker to flick the ball past the last line of defence into the path of Bridge who made a perfectly timed run. With front position over the final Jets defender he only had to beat the keeper, it wasn't the prettiest effort but it dribbled over the top of Birighitti and Bridge shielded the ball as it fell over the line. Emile Heskey did little of note in the first half, his only major impact being knocking Ante Covic over as the keeper grabbed a ball in the air, Heskey received a yellow card for the woeful challenge and was lucky to escape a second for dissent. Newcastle came out in the second half playing in a formation with 3 at the back, allowing more numbers in attack. The Jets slowly reclaimed the momentum of the match. Adam Taggart had the best of the Newcastle chances, a Topor-Stanley and Heskey challenge resulted in the ball floating over the last line of defense for Western Sydney. Taggart used his pace and steeled himself for a first time volley from the edge of the area. The shot beat Covic but was slightly off target, hitting the post and rebounding away. After suffocating the Newcastle challenge, Western Sydney took complete control of the match. Bridge ran past the Jets defence to run onto a flick on from Kresinger, he chested the ball down but his half-volley flashed wide. The miss didn't cost the Wanderers at all. On 79 minutes Jason Trifiro hit an accurate corner out to Rocky Visconte on the edge of the area. The first touch of Visconte put the ball out in front of his stride, the second setup a shot on his left, and the third touch was missile strike that left Birighitti with no chance despite his full length dive. Even at 3-0 up Western Sydney refused to take their feet off the throats of Newcastle. Bridge should have completed his hat-trick during injury time. Ruben Zadkovich who had been completely ineffective with several wasteful and overly ambitious long shots, left his keeper out to dry with a horrible back pass. Kubi closed down Birighitti, the keeper managed to beat the onrushing attacker but could clear the ball only as far as Bridge who lined up a first time shot with the empty net gaping, only to see the ball agonisingly curve wide. Shortly after the miss the referee blew the whistle to end the match and send the A-League premiership to Western Sydney in their inaugural season. The Wanderers will play a semi-final in two weeks in an attempt to make the 2012-13 A-League Grand Final. 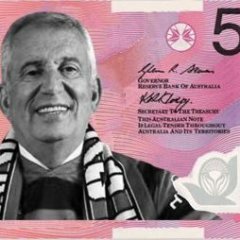 Winning the Premiership also guarantees that Western Sydney will play in the 2014 Asian Champions League with a direct entry into the Group Stage. The Wanderers next match is the semi-final, against the lowest ranked winning team from the two preliminary final matches, at Parramatta Stadium on Friday the 12th of April at 7:30pm Eastern Daylight Savings Time. Tickets to the Semi-Final go on sale to Wanderers members on Tuesday the 2nd of April at 9am, to the Football Family on the 3rd, to the General Public on the 4th through to the 7th, Away Supporters on the 8th and once more to the General Public from the 9th. Don't see much sleep tonight....we are number one, we are number 1 !!! got to say lads, if circumstances permit, its definitely worth staying up the night. don't think a trek all the way back down after that would be easy. I love our team! Well done all on a great day a great atmosphere and a great win! Loved Labi taking the 'plate'. Just got breath tested on Silverwater rd after 2 hr drive and the cop asked me if we won. He was stoked so we had a chat about wsw. I love our team! Mate with the conversations I had with Jets supporters both before and after the game, the party is in Newcastle. So much genuine appreciation for everything we've achieved was overwhelming. One bloke cracked me up and said we could win 5 nil for all he cared "after hating the mariners as much as we do, there's no hate left" loldelol. And how good was Rocky's goal! The Newcastle fans were fantastic. They genuinely were happy for us. I has a good laugh when I stopped at Heatherbrae on the way up to my parent's place and asked a guy in a Newcastle jersey "what the score was in the game tonight". When turned around and saw me in my Wanderer's gear, he laughed and told me that I'm going the wrong way before congratulating us on the premiership and wishing us well for the finals. I've had a great day all round. Well done to the fans, the players and officials. You have done us all proud. A special thank you to all the well wishes from fans of other clubs. Very nice to hear. This. So many stuck around to congratulate us. Best opposition fans I've encountered. Very different to any Knights supporters encountered in the nrl. I wonder what the demographic is up here? They really seamed to take to our whole ethos. Sheer stark contrast to bling FC ? Simply having another consistent team that challenged their arch enemy ? I agree completely sat in amongst jets members all happy for us, some jets kids got in on the WDWSF and loved it. Spoke to a few of the Jets fans as well today and they were happy that we won it as well. Great game. Great result. Great night. As mentioned Jet's fans and squadron were great. Labby with 'the plate' was awesome! Popa coming to celebrate with us! 359 days from creation to our first silverware! awesome day, awesome night, awesome game!! 8 years in the waiting for this day. ***** love it. tyson in the rbb was epic. was going at it. newcastle staying back and congradulating us was nice. all over a great game, and a great year. i said at the start of the season that finishing 6th would be like winning the league, but never thought that we would actually have won it. congrats lads 99% of your supporters were fantastic, but unfortunately some have spoiled your reputation postgame. However I will reiterate what other jets supporters have said, the fact that the mariners lost the Premiership, its a much easier loss to take. And to top it off, maybe our useless coach will now also get the arse. Mate, i REALLY hope you're not giving oxygen to the tweet from a guy called 'True Anglo' that has an avatar of Pauline Hanson ? Nothing to see there, as stated by your own fans. No mate, check out the tweets from @zadslads (who I know), and I was in a group that was accosted by some WSW casuals who had to be moved away twice by police, as they were looking for a fight. Like I said, 99% of your guys were fantastic.